I upgraded to this crankset because the original no-name crank that came on by bike had gears that were out of true. I stayed true to my original gearing and got the 28-38-48T set, and went with the longer 175mm crank arms, and I'm glad I did. I considered going with the next level up the "Shimanao Alivio" but I would have had to change my BB to make that work. This crankset matched my 122.5mm BB perfectly, in fact, to my knowledge this is the best crank you can buy that fits a square taper 122.5mm BB. I immediately noticed the following improvements with this crank: Shifting has become much smother. The gears are nice and straight so adjusting my front derailleur is no longer an impossible task. Compared to my old crank this one is extremely light, at least a pound if not two lighter. The crank looks very nice. This set is very easy to install. I got in on my gt bike within hLf an hour. It is light and look great on the bike. So far so good. The delivery of this items was one day late. When I checked out it said "get it tomorrow" but it took 2 days to get it. My son bent all three rings on his stock specialized entry level mtn bike. I wanted a budget friendly replacement as he had outgrown the bike and I was likely to sell it. Out of the box, these appeared to be better constructed than what was on the bike, specifically in the rings and supports. Once installed, we have had no issues with shifting or flex. Jenson USA has a huge range of products for all of my old and new bikes. Overhauling my old 1990s Trek road bike. This was a great find at a great price. I will probably pick up another one when I overhaul my wife's old specialized mountain bike from the 90s. Without a nearby bike shop or without having to pay Bike Shop prices it's nice to have these products available very affordably. Shipping was fast and free. Inexpensive. Bought to replace road crank on commuter bike. Easy to disassemble and replace chain rings. Used a Raceface Narrow Wide Single and dumped the front derailleur. Don't want a Triple... so this purchase was all about price. Wish it was 110 BCD so I could use a 42T. Had to settle for 38T so I can't quite go as fast as I wanted to. But it's a decent compromise. I did leave the small tooth ring on to use as a spacer. As this is kind of a Frankenbike the little additional weight from doing so doesn't matter to me. Inexpensive and square taper bottom bracket was easy to install. Cheap solution for older bikes you want to get going again. Reasonably priced, this is a perfectly serviceable replacement for the Trek 7200 Hybrid it's going to - Jenson shipped incredibly fast ! CONS: Weighs more than my old STX crank. There were no problems with delivery promptness and condition of merchandise. Great replacement for no name crankset on bikesdirect bike. Performing a tune up and wanted slightly better product to fit my budget. I needed to replace a budget crankset on a Raleigh and didn't want to spend a lot. This triple crankset is solid and was a direct replacement (slight adjustment to front derailleur limits needed). This crankset has the advantage of bolt on chainrings which aids cleaning. The old one had everything riveted together. Light, inexpensive and good quality. Mount a 29 or 30t chainring and you're ready to roll!! Nice upgrade, worth the money. Better then my stock generic cranks. I would recommend to others. Wanted a crank set that matched my derailers on my 2019 Giant Roam. The stock ones were a no name generic set which are heavy and didn't look nice. These cranks are a little longer then my previous ones. They are lighter then the stock ones and look so much nicer. They are very smooth and preform well for a nice low price. Very happy with the upgrade to my bike for a little bit of money. Got these on a great sale and couldn't be happier for my every day use of casual riding, light trail riding and generally riding for exercise. I did not need a top of the line 2 to 3 hundred dollar crank set. These fit my needs perfect. I got this to put on a 90s Montague folder, and it worked fine. It's not light or stylish, but it's way better than the 20-year-old crap that was on there before. Well built, and feels solid. Not the lightest but seemingly durable. I liked the removable chainguard to make cleaning easier. I replaced the crankset on my wife's older 7 speed Specialize bike & she loves it. Very smooth pedaling and it looks great. Highly recommend for the price which includes new bolts too. Thank you for the quick shipping. Got the bike back on the road asap. Fast easy service and good quality reasonable priced parts. I purchased this crank to replace the cheaper tourney unit on my bike. Bike seems to shift up to the larger chain rings. Very nice replacement! Nice crankset for the money. Replacing crankset on 2012 Specialized Vita Elite (women's small). It was a bit more difficult to find a triple crankset replacement for my bike. Glad I found it at Jenson USA. Just what I needed to refurbish an older bike. Quick shipping too. Great product, great service, great price. I don't know how they do it. I received my product(s) a FEW days after ordering it without any additional or special shipping charges. I definitely recommend Jensen. I installed this on my 1997 Cannondale Cad 3 and am very impressed with the quality. Very well made and attractive and shifts perfectly. I don't think you would go wrong even at full retail but for $29.99 it's a steal. It is only slightly heavier than much more expensive cranksets. The chainring bolts are not fake like other cranks in this price range. Very durable without adding a lot of weight. Nice upgrade. I went with the 48 tooth, cause I spend much more time on the road then off. Easy to install with decent instructions included. Excellent crank for the money; good buy for a single speed conversion with a narrow wide chain ring. Go for a chain ring bolt tool or buy new bolts with allen heads to make life easier. Used this to convert my son's bike to a 1x drivetrain. Nice high quality cranks at a low price. Every thing fits works fine. this crankset is driving a 14-34 mega range freewheel. Running on middle chainring (32T). Its a great crank set for the price. I was looking for something with a square taper bottom bracket because those bottom brackets are cheap and incredibly reliable. To find that on a crank set with replace able chain rings was amazing. I love this crank set! Packaged and shipped in original Shimano box. I bought this as a replacement for my Kona Dew Plus and it's the exact fit. Fast shipping & no additional cost upon delivery! I bought two of these. The 22 to 42 tooth set and the 28 to 48 tooth set. I needed the smaller gears, but I am defiantly going to be keeping the larger set for a road bike once I get one. The small ring helps me get up heals with relative ease considering that I got a steel frame older than I am. I'd assume that I could get going pretty fast on the large ring, but since I don't have any break cables opn my bike right now, I am not willing to test that just yet. I can't wait to take this out on my local trails to test it out. Used this to reduce gearing on a Fatbike. Only kept the 22 ring. i like the crank and i like the price! delivery was prompt. crank arrived in excellent condition. no issues! Replaced a super bent up suntour 3x8 speed. Cheap way to not have to upgrade the whole groupset. Decent crank for the money. Have been running it for 2+ years without issue on my hardtail. I ride copper harbor and Wisconsin area regularly without issue. I upgraded the driveline on my Giant Escape hybrid bike by changing the crankset from an inexpensive one piece Suntour to the Shimano Acera . I needed to change the bottom bracket to a Shimano and changed the chain to Shimano. Much better! does this come with spindle? BEST ANSWER: Don't know what you mean by spindle. It DOES NOT come with a bottom bracket if that's what you mean. Are the chainrings bolted or riveted together? What size BB do I need for this product? BEST ANSWER: 68x122.5 fit mine perfectly. Does this set come with both crank arms? BEST ANSWER: Yes. I have never heard of someone selling a crankset that required paying more for the other crank arm. Sure does. Any crankset you purchase new will come as a set, both sides. Yes, it comes with both crank arms, the screws, and caps for the screws. Yes, both right and left crank arms come with the set. Yes. Also with the two retaining bolts. Yes, it comes with both crank arms. Yes, both crank arms are included. Yes. It comes with left and right. Yes, both arms are included. yes, mine had both arms. Does this include the crank bolt? BEST ANSWER: Yes; I received two bolts w/the M361 Square taper crank. Crank bolts were included with mine. Yes, the bolt is included. Would it work just fine with 10 speed chain ? BEST ANSWER: ** I added chainring spacers to move the chainring (in the middle position) out a bit to improve chainline. Its made for a 10 speed. Hain so yes it should. can one remove the chainguard? BEST ANSWER: Yes, you can remove the chain guard. There are 4 small screws holding it to the large chain ring. Very easy to remove with a Phillips screwdriver. I hate to answer a question with a question, but why not just order one without the chainguard, since they are also offered that way? I have the M351 crankset. Is there any difference between the two? Can both be converted to 1x drive? 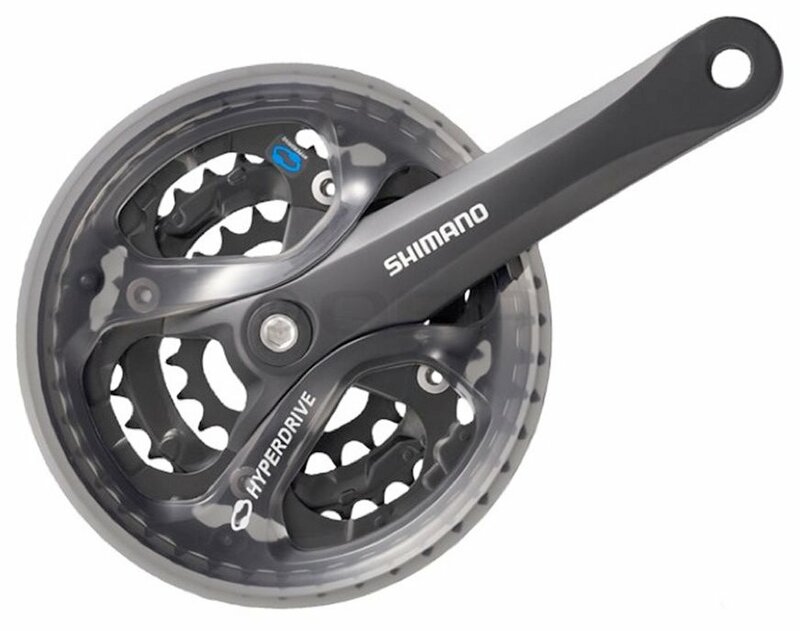 BEST ANSWER: Both cranksets are very similar, the M361 does not have a bash guard and maybe lighter weight marginally. Both can be converted to 1x, but you would beed a chain keeper and a clutch style rear derailleur to avoid dropped chains. I have not tried it. But, all three chainrings are removable. So, I'm pretty sure that a 1x set up is possible. Is the inside face of the inner chain ring flush or are there flanges that project inward? BEST ANSWER: Both sides fo the inner chainring (28T on the one I have) are flush with no ramps or flanges. The middle and outer chainrings are the ones that have the hyperdrive ramps. Does this set use the standard 104/64 mm bolt circle diameter? BEST ANSWER: Yes it does...if your BB is not 122.5mm, you will need that as well. 113mm is too short. it's compatible with 9 speed? Could this crankset be used on a fat bike that has a square tapered bottom bracket, with a 170mm rear axle? BEST ANSWER: Yes I believe it can. I use it on a winter bike and it has been very good. I purchased the M361 as an upgrade for my Mongoose Hill Topper, added new UN55 122.5mm bottom bracket, but need to replace triple derailleur. Can anyone recommend the best fit? BEST ANSWER: You will need to know if your current derailleur is top or bottom pull and the o.d. of the tube it clamps on. Also make sure it's for the speed your bike is. Is it possible to convert this crankset to a 1x drive train? BEST ANSWER: Yep. Just dont use your front derailleur. Is the chainline 50mm with the 122.5 spindle length?